페낭, 말레이시아의 료칸 문트리 부티크 호스텔 | 호스텔월드에서 예약하세요. 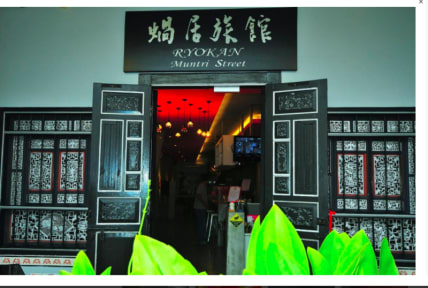 Ryokan Muntri Boutique Hostel is established as the first ever flashpacker hostel in Malaysia. 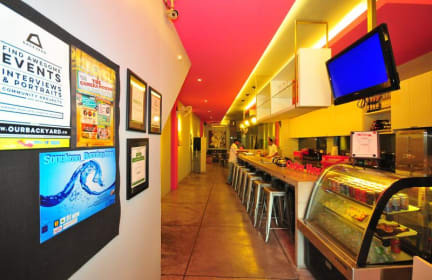 Our unique Japanese themed accommodation offers you attractive facilities with funky minimalist lobby design, and most importantly, an all-round cultural experience. Ryokan is located on Muntri Street, which is smacked right in the middle of the Unesco World Heritage territory. The rich influence of culture and heritage of this vicinity adds yet another trait to its personality - a backpacker haven. Sandwiched between the famous barstreets of Penang - Jalan Penang and Lebuh Chulia and surrounded by picture perfect architectural and cultural sites, Ryokan is the perfect accommodation to be for an all round experience. So come on, make a DATE with us, and we'll shower you with the experience of your lifetime. Like our tagline suggests 'You're not a flashpacker if you haven't stayed at Ryokan!' We look forward to seeing you soon. Check-out time is at 12pm, and check-in is from 2 pm onwards. If the check-out time of 12 in the afternoon is exceeded you will automatically be booked for another night. We won't be surprised if you like our place so much that you automatically want to stay! No for real, our staff really needs this time to clean the place for the next guests. Valid identification is required. We only accept national ID cards or drivers license and passport for foreigners. To make the stay pleasurable for everyone please respect each other's peace, privacy and belongings. Stealing is not cool; karma will knock you right in the head! Only paying guests can stay overnight. We are happy to welcome visitors of our guests in the bar area but they are only allowed to stay till 11 pm. Smoking inside Ryokan is strictly prohibited. At the outdoor bar area smoking is allowed. We're not in a hippie commune or a war zone, absolutely no drugs or weapons allowed! We reserve the right to confiscate them and notify the authorities and they don't joke around. Consumption of alcohol is restricted to the restaurant/cafe. Alcohol abuse must have been fun when you were twelve but by this age? Please drink responsibly. For health and hygiene reasons we cannot allow pets or animals. There's a Bird Park, Butterfly Farm, Snake Temple and a Botanical Garden filled with cute little monkeys, we advise you to pay them a visit if you do get lonely. For the same reasons we ask you kindly to keep dorms and public places clean and tidy, pick up after yourself. Our staff is not your mom. We want to be the cleanest hostel you've ever stayed in but for that we need your help! We have a close relationship with the Salvation Army and any clothes hanging to dry throughout the public area will be donated to them. As will soap, shower gel and maxipads that you leave laying around. Sorry guys but Ryokan is not liable for any damage or loss of your belongings. Please take care of them. Alright, maybe not a rule but a more a wish: we hope you have a wonderful stay!